I love that we live in a time where the modest and familiar burger is treated with the same skill and care as a seared duck breast or other fancy-sounding entrée. These impressive creations are no longer haphazardly assembled by slapping together unwanted scraps and trimmings and are no longer regarded just as greasy pub food. These burgers come a pedigree. 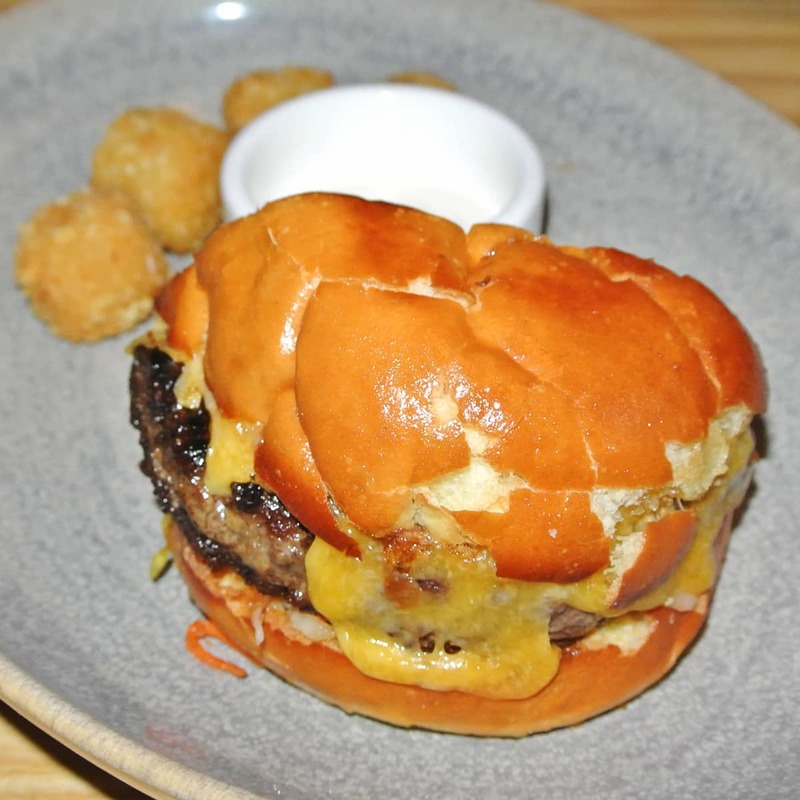 Brilliant chefs now utilize custom butcher blends of meat and have truly mastered the art of balancing and enhancing those bold, rich, cheesy flavors while still retaining the burger’s undeniably attractive gutbomb essence. 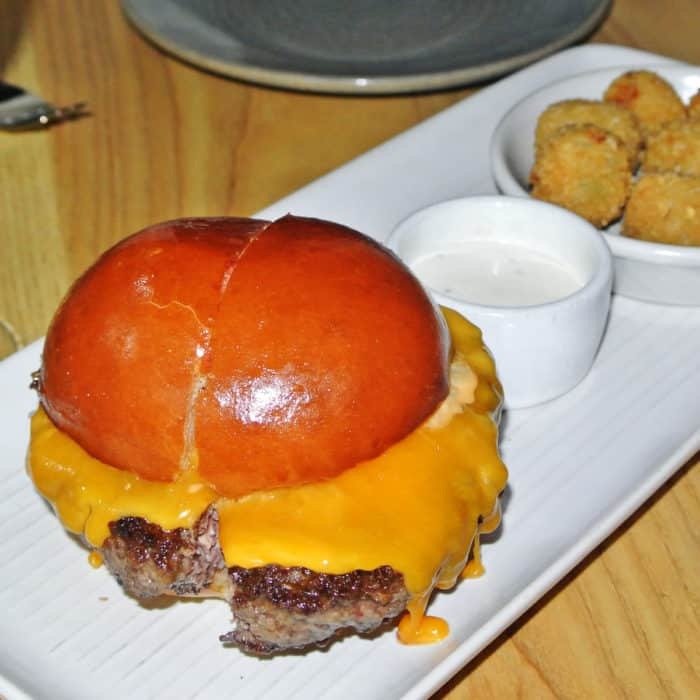 These cherished burgers have now become a highlighted menu staple at most high-end restaurants and while many claim to serve the best in San Francisco, I think the title belongs safely to the one I’ve had at Stones Throw. On Hyde St. at the south edge of Russian Hill’s restaurant row, you’ll find Stones Throw. This ever-popular restaurant is constantly busy and always has its prime dinner slots reserved on Open Table far in advance. So, in order to experience the excitement for myself, my visits had to occur at off-hours (such as a late 10 PM seating on a Friday night or a quite early 5:30 PM before the main rush). 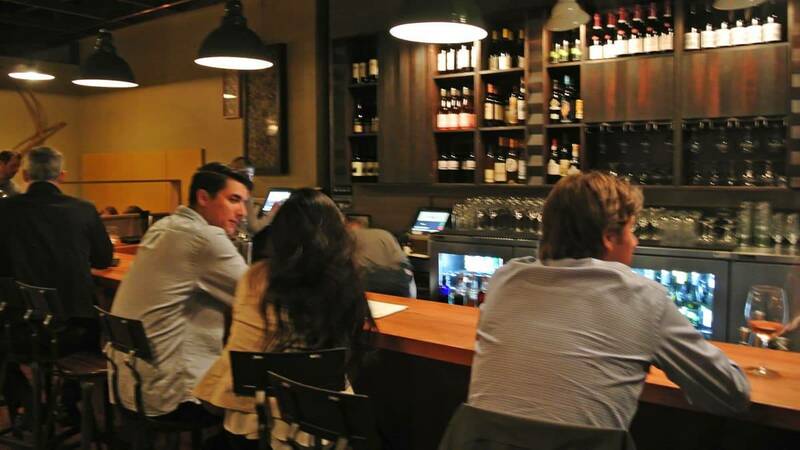 Similar to their sibling restaurant, Fat Angel Food & Libations, the atmosphere is both comforting and classy without even a semblance of stuffiness. The decor relies heavily on natural stained woods with warm mustard yellow tones throughout. 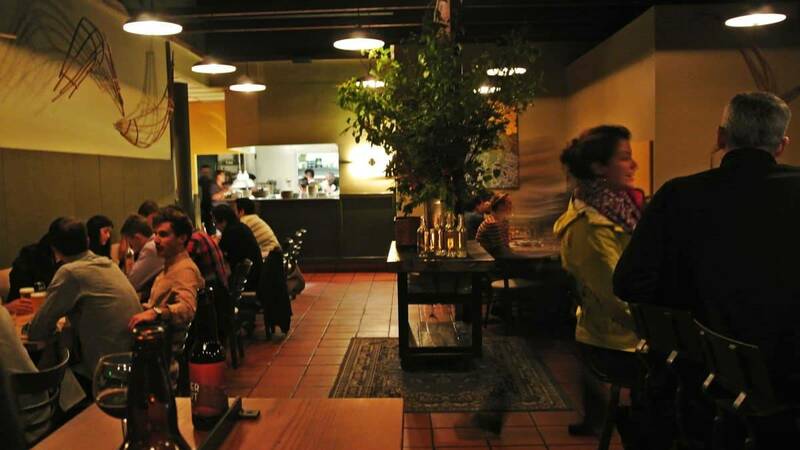 Again, like Fat Angel, the menu includes an impressively extensive wine and beer list and relatively concise dinner menu. The food portion of the menu is broken down into categories including Snacks ($8 a piece), Starters (generally range from $12 to $16), and Mains (that cost as little as $22 and max out at $29). The mains section also includes their ever-present, very reasonably priced, and super-popular burger that only costs a mere $16. For me, this is my ideal date night kind of place. While dining at Stones Throw, we’ve found that the dishes offered in the Snacks section have reliably been impressively elegant and were an excellent value. For the best bang for our buck, our most effective dining strategy involved ordering beer and/or wine with just two Snack items and splitting one of those now-famed burgers. And depending on our level of appetite, a possible add-on of an additional shared entrée. On our first visit, we selected the Duck Pâté & Mousse from the Snack section which was served with warm soft pretzels. There was a truly amazing combination of textures in the dish. 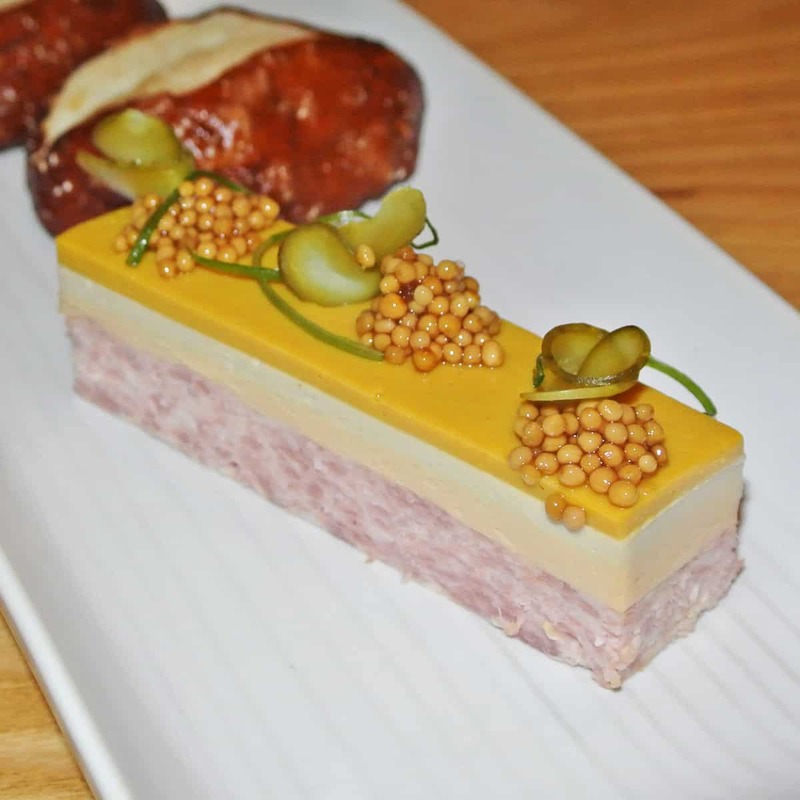 First, there was the thick slab of meaty, rough-chopped, country-style duck pâté which was topped with an equally thick layer of rich, creamy, unctuous duck liver mousse, and a simply brilliant thin, solidified sliver of French’s yellow mustard. The gorgeous layered concoction was topped with shaved cornichon slices and mounds of vinegary, caviar-like mustard seeds that popped between my teeth for additional texture and added a tangy, sourness to every bite.The richness of the pate and sourness of the toppings paired perfectly with the dense, salty, crackly pretzel bread and created wonderfully complex and irresistably delicious bites. It served as an excellent vessel to transport all of that elegant decadence to my mouth. But, even more representative of the pure genius occurring in Stones Throw’s kitchen is the Snack they call Puffed Potato & Eggs. An order involves a small bowl filled with four golden potato orbs stacked into a pyramid shape atop a substance they called cauliflower mousse. This is all garnished with thin-sliced cauliflower, minced chives, and crispy fried chicken skin cracklings. But, that’s not all. 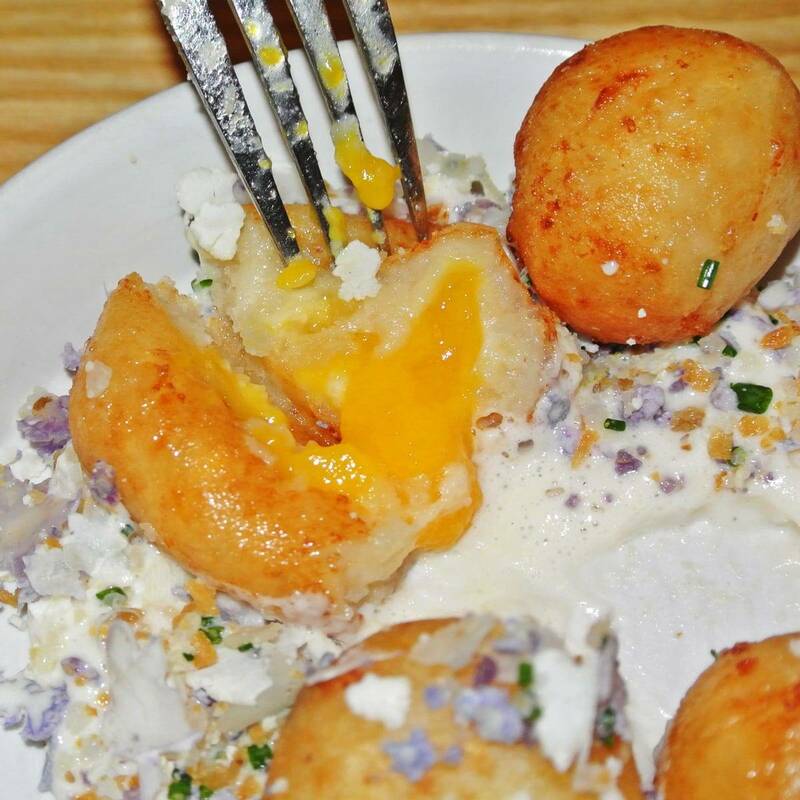 They’ve also encapsulated a brilliant hidden surprise inside of each crispy, deep-fried mashed potato sphere — a whole, runny egg yolk. Really, there are two ways to go about consuming this dish. You can either choose to chop into the ball with the edge of your fork and let the yolk intermingle with and run over all of the other wonderful things on the plate. Or you can do what I did and pop the entire fried ball into your mouth whole so the entire yolk bursts when you bite down. Both are totally acceptable and truly delicious ways to enjoy this dish. 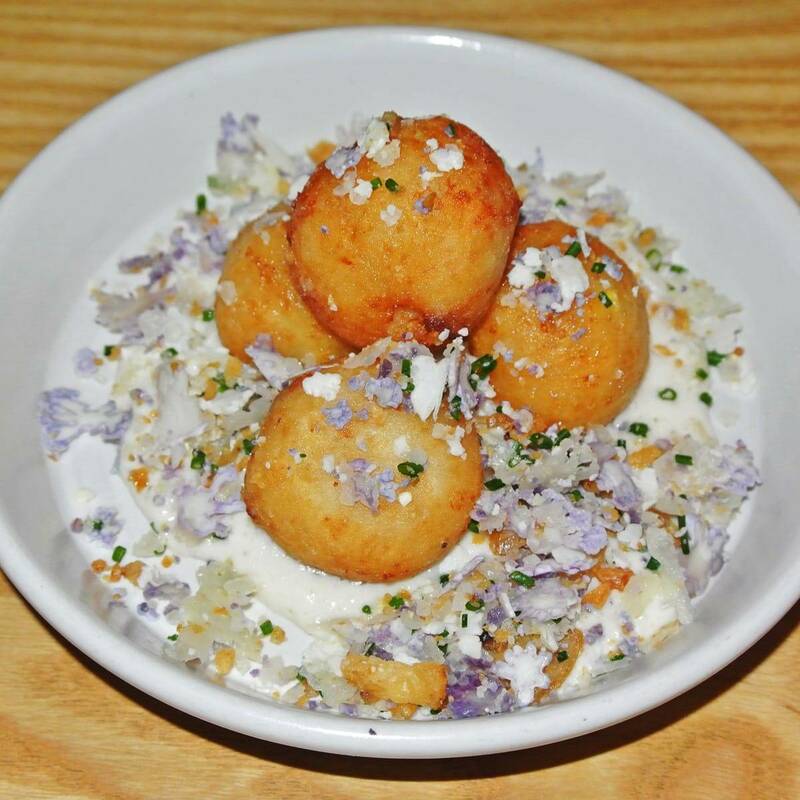 The balls really are good, but the dish wouldn’t be complete without that silky, smooth, light-as-air cauliflower mousse. I love the way it’s studded with beautiful little bits of purple cauliflower, chives, and those outstanding crispy, salty fried chicken skin crumbles. It’s a super-bold dish and I’ve found myself particularly struck by the chef’s brash confidence as evidenced by their heavy-handed salting. Both times I’ve had it, it was right there on the edge of being too aggressively salted, but actually done perfectly. Truth be told, the portion of each of these Snacks was about twice as large as I would have expected for only $8. 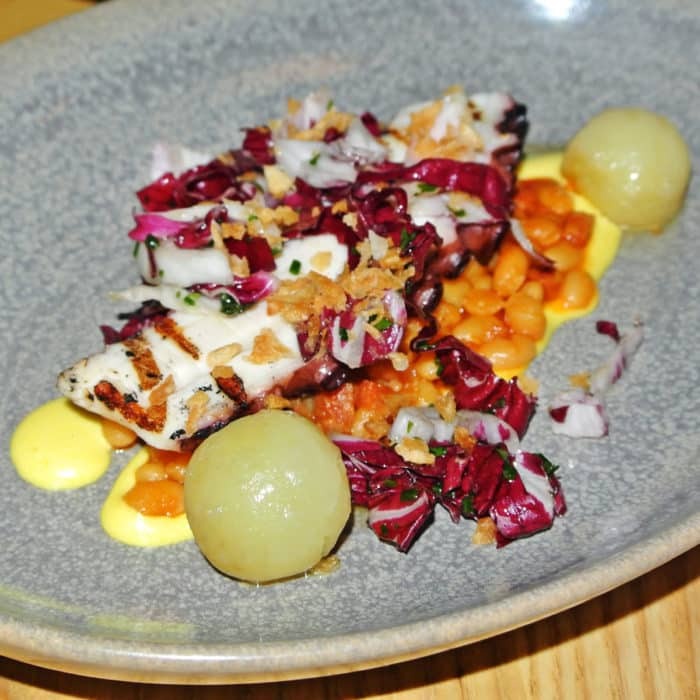 Alternatively, you could consider getting something from the Starters section such as the Grilled Spanish Octopus. This was another flavorful, beautiful, and incredibly well-executed creation. The portion of actual octopus tentacle was impressive, but the kitchen’s adept abilities with the infamously challenging ingredient was beyond impressive. It was amazingly tender, just about as tender as any octopus preparation I’ve ever had. True to its name, the dish’s flavor profile leaned heavily Spanish, utilizing those signature Spanish tapas flavors and ingredients like confit potato, creamy white beans, meaty crumbled chorizo, and that same bold, smoky, creamy saffron aioli you often find covering papas bravas. At $16, it wasn’t quite as good a value as the Snacks, but it was still a real winner of a dish. And now that it’s time to talk mains — you know what that means — BURGER TIME. 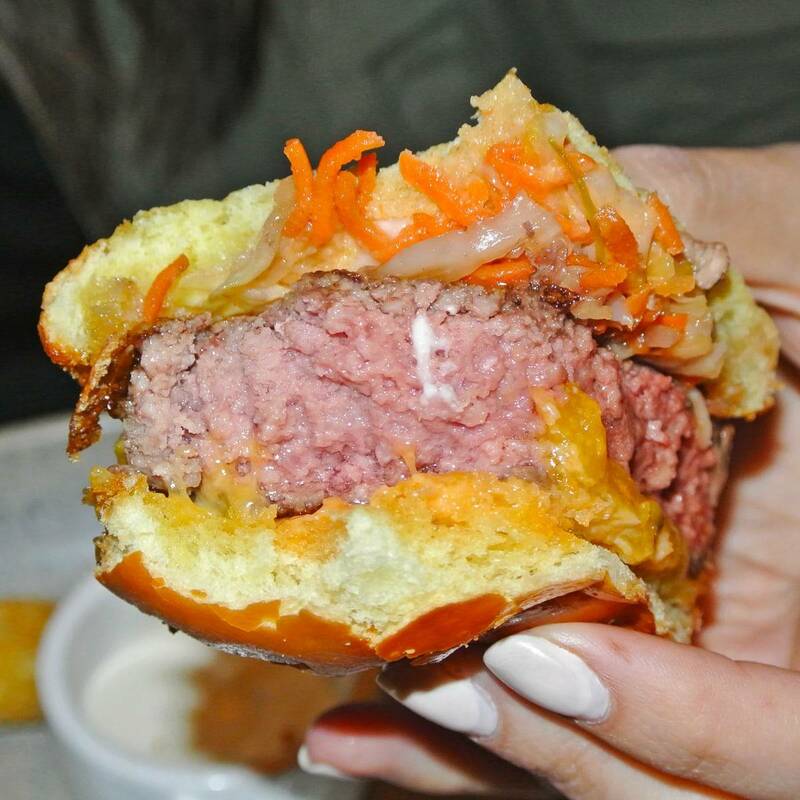 On every visit, we’ve ordered their much-loved burger to see if could live up to our lofty, artery-clogged memories. Consistently, it has blown us away. They call it “Da Burga” aka Da Disaster which is kind of a preposterous name, but it’s also a quite accurate and appropriate way to describe how incredibly and ridiculously juicy and runny this burger is. It comes topped with melted cheddar along with a side of ‘everything’ baked potato tater tots with a side of peppercorn ranch dipping sauce. No doubt about it, this is the best burger I’ve had in San Francisco and definitely stands toe to toe with the best burgers in the world. The juicy, bright pink beef was loose-packed, but impressively charred on both sides and somehow retained its medium rare temperature. And not that it even needed it, but I dunked that sucker directly into the creamy, peppercorn ranch sauce for extra oomph. And those tots — oh man, those tots. They are for sure the very best I’ve ever had literally anywhere on the planet. They were extremely crisp and delicate on the outside and light, hot, and fluffy on the inside. Though they collapsed under the gentlest fork pressure, they still reminded me of a cross between the perfectly crispy hash browns and perfectly creamy Italian arancini. Except with a rich, smokey, meaty, bacon-like flavor. Unsurprisingly, the ranch dipping sauce was amazing on these too and I once again foud myself impressed by the chefs’ bold and aggressive, but fully fitting salting hand. Ok, so I hope it’s abundantly clear that the burger is a must-order, but I imagine people might be interested in more than just a burger as a main — no matter how freaking good it is. Fortunately, Stones Throw has a frequently changing selection of high-end entrees to select from too. 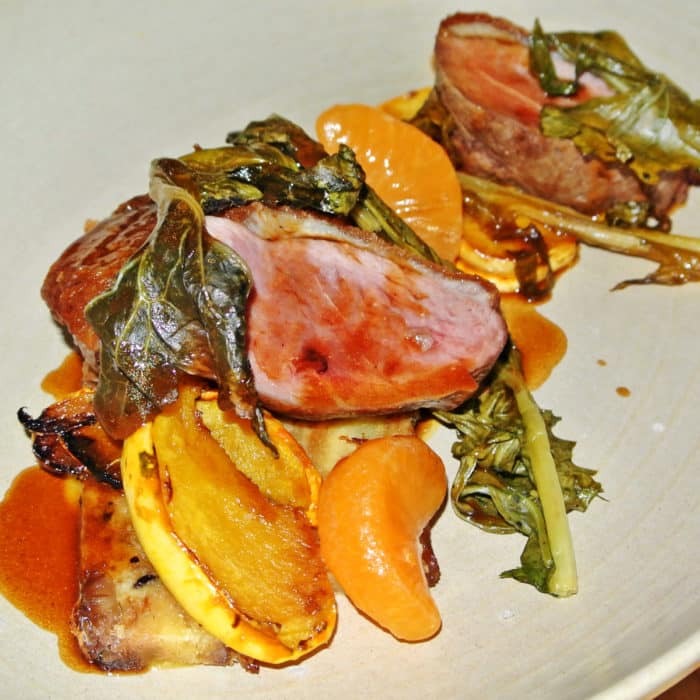 On one visit, we ordered their 38 North Duck Breast which used high-quality, locally-sourced meat and paired it with the wintry Asian-inflected combination of duck confit, delicata squash, satsuma, and Peking jus. The crispy-skinned duck breast meat was by far the best part of the dish (as it should be as the featured ingredient). The rest of the dish was good too, but a little mild and not quite as over-the-top, in-your-face outstanding as the rest of the restaurant’s offerings. At $29, it was vastly the most expensive thing we ordered, and still not our favorite when compared to the cheaper offerings. And although we were already extremely full by this point in the meal, we just couldn’t resist glancing at the dessert menu. We soon learned that this constantly changing menu is built from the written-in suggestions from previous diners based on their favorite childhood treats. 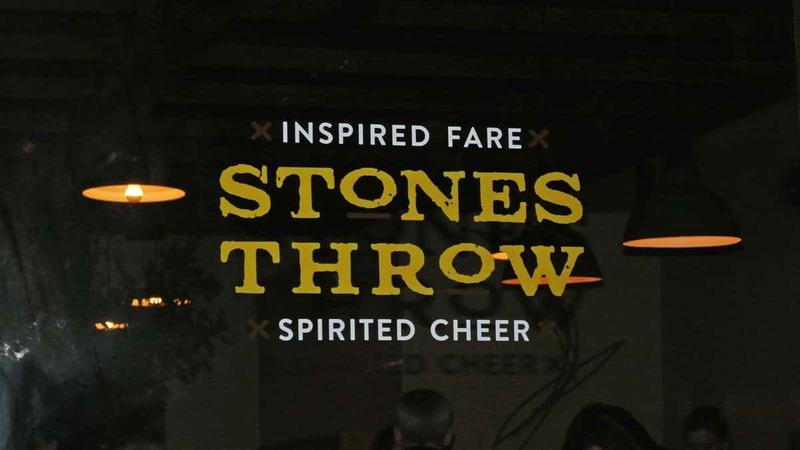 While many bear straightforward and humble names, they’ve all been given the gourmet Stones Throw treatment and have been transformed into something special — worthy of a $9 price tag. In general, I’m not a big dessert or sweets guy, but there’s something undeniably endearing about this clever way they’ve designed their dessert menu. On one visit, we just couldn’t resist going for the German Chocolate Cake which was as gorgeous as it was unusual in appearance and flavor. 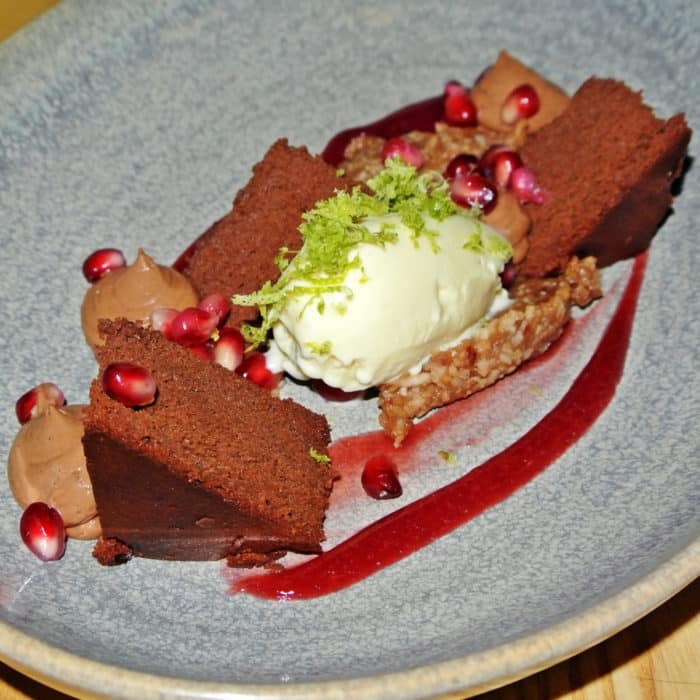 The dish included three triangular wedges of dense, rich, fudgey chocolate cake, dotted with dollops of fluffy chocolate mouse, a scoop of too-floral lavender ice cream, a smear of sweet, fruity, raspberry coulis, a lovely grating of lime zest, and a generous handful of pomegranate arils scattered over top. There was quite a lot going on in this dish between the varying temperatures and textures before we even mention the combination of rich chocolate, sweet fruit, sour zest, and floral ice cream. The ice cream was the only part I could have done without. Otherwise, this was a killer way to close out a meal. All in all, I think this place is totally spectacular. It’s quickly become one of my new favorite date night spots in San Francisco (edging out my beloved The Cavalier). 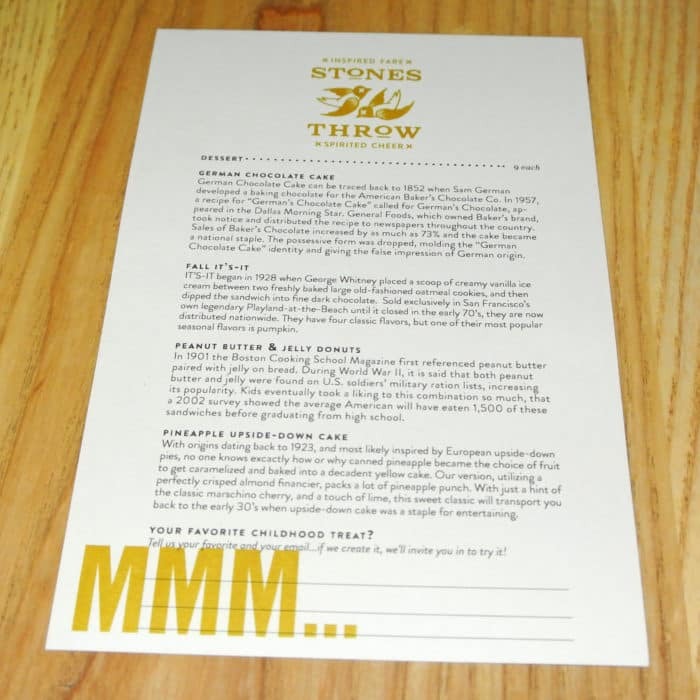 It’s definitely possible to spend a lot of money on a meal at Stones Throw, but it’s also quite easy to have a fabulous meal there if you make your selection carefully even though the splurge would probably be worth it anyway. 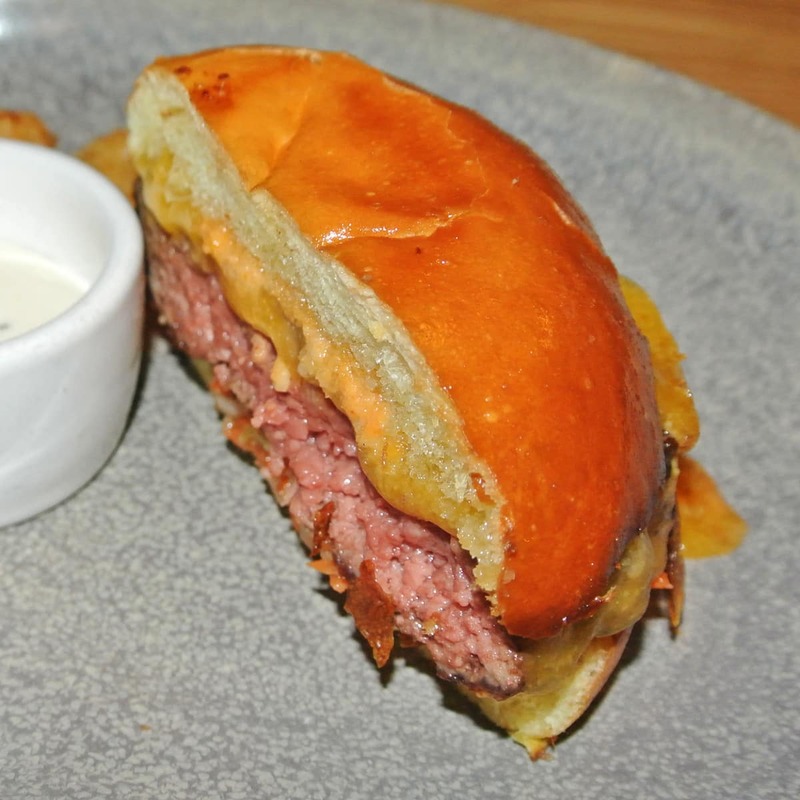 Between the relaxed, but elegant atmosphere, extensive beer and wine offerings, their extremely inventive and well-executed menu, and that flat out ridiculous burger, it should be easy to see why I’ve fallen for this place. 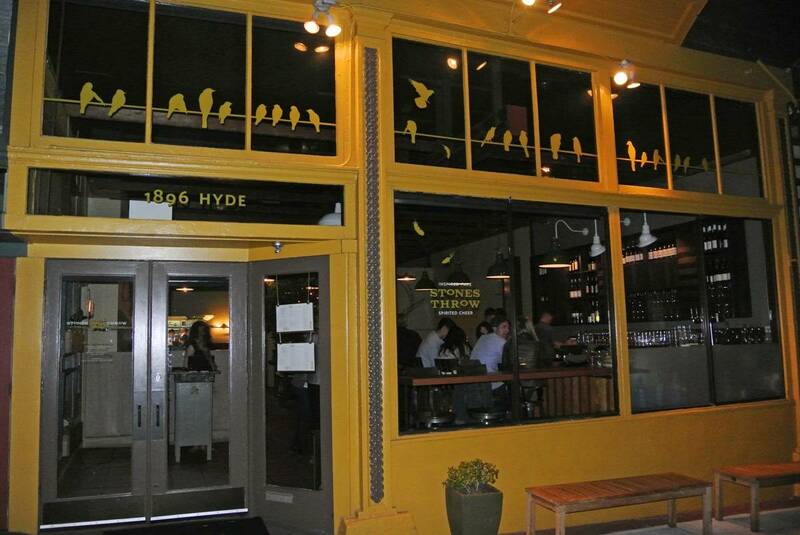 Got a burger you think is even better in San Francisco? Let me know in the comments below.